Having extra money in your savings is a resource. The definition of a resource is something that is ready to use if or when it is needed. 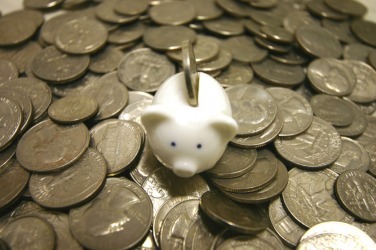 An example of resource is extra money in a savings account. An example of resource is a friend with electrical skills who has volunteered to help install a lighting fixture. An example of resource is spring water on a piece of land. "resource." YourDictionary, n.d. Web. 21 April 2019. <https://www.yourdictionary.com/RESOURCE>. Something that is available for use or that can be used for support or help: The local library is a valuable resource. often resources An available supply, especially of money, that can be drawn on when needed. The ability to deal with a difficult or troublesome situation effectively; resourcefulness: a person of resource. A means that can be used to cope with a difficult situation; an expedient: needed all my intellectual resources for the exam. Obsolete French from Old French from feminine past participle of resourdre to rise again from Latin resurgere re- re- surgere to rise ; see surge . From Old French resource (“a source, spring"), from Old French resourdre, from Latin resurgere (“to rise again, spring up anew"). See resourd, resurgent, source. An element of hardware, software or data that is part of a larger system. For example, network resources are the available servers, disk arrays and printers in the network. Software resources can be programs, utilities or even smaller elements within a program. Data resources are the files and databases that can be accessed.